Contrary to popular belief, the Pantanal, in mid-west Brazil, is THE hotspot for wildlife watching in South America and not the Amazon. Although the name suggests a swamp area, the Pantanal is, in fact, a vast area of seasonally flooded plains. During rainy season, the local rivers burst their banks, bringing with them millions of fish. When the water recedes, the fish are trapped in small water courses and ponds, to be feasted on by birds and caimans, forming a rich and complex food chain. This seasonal flooding also means that this whole region, roughly half of the size of France, has no vocation for intensive farming, resulting in an area of huge cattle ranches with very few towns and people. 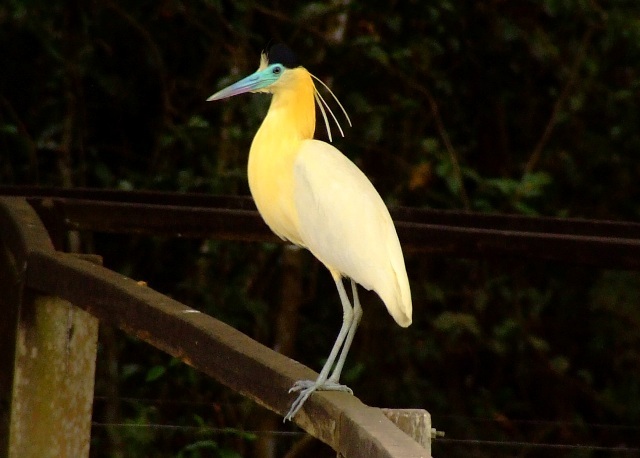 All these unique characteristics make the Pantanal an area teeming with wildlife: birds are the main attraction with almost 650 species documented, making it a must visit destination for birdwatchers. Mammals are also easily spotted in the open areas of savanna. Giant otters, armadillos, anteaters, capybaras and howler monkeys, besides the conspicuous caimans are commonly seen. Jaguars’ sightings are rarer but there is an increased chance in certain areas due to monitoring and conservation projects. Further south, the small town of Bonito is famous for its underwater attractions. Due to the local geology, the rivers have high concentration of calcium carbonate that precipitates all impurities from the water, turning them into natural aquariums. While floating downriver you can come into close contact with many species of fish, including the great Dourado and the beautiful Pacu. While the rivers are the best known attractions, there other trips, including some great waterfalls and caves, which are worth visiting. For the more adventurous, certainly the most spectacular attraction in the whole of Bonito is the Abyss of Anhumas, a 72 m deep abyss leading to an underground lake with crystal clear water and giant stalactite formations. Araras Lodge - one of pioneers of ecotourism in Northern Pantanal, it has professional guides, comfortable accommodation and a good cost/benefit. Embiara Lodge – a family-run, exclusive lodge in the most remote area of Southern Pantanal- Pantanal Nhecolandia. An excellent option even for second timers. 4 days/3 nights from US$ 1659.00 per person based on 2 sharing- including transfer by air taxi one way for an unforgettable flight over the savannah. 5 days/4 nights from US$ 1479.00 per person based on 2 sharing. Offers valid for travelling in June 2012. Please consult us for more details.